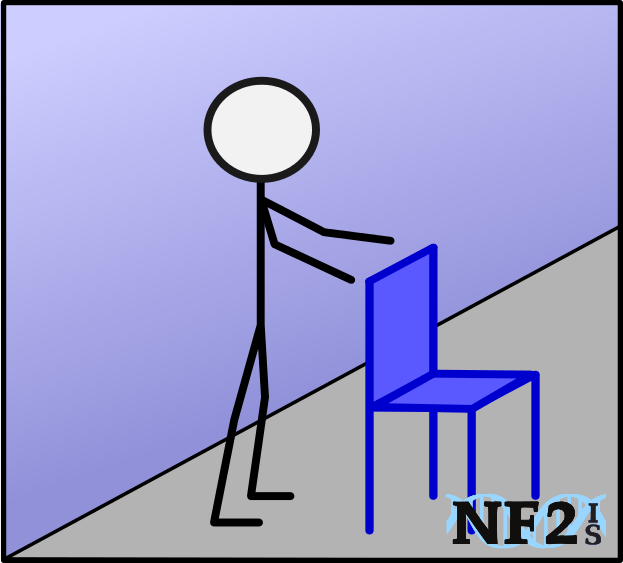 People with Neurofibromatosis Type 2 (NF2) develop walking issues for many reasons. 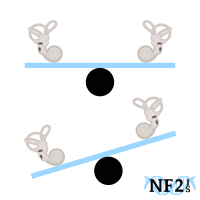 Most often the walking issue starts as a result of imbalance from tumor growth that results in vestibular nerve damage, which is a branch of cranial nerve 8 that runs from the brainstem to the vestibular system for which provides the inner ear for balance. The growth of a schwannoma tumor on the vestibular nerve, vestibular schwannomas (VS)/acoustic neuroma (AN) , will result in an individual facing single-sided vestibular system damage and will be the start of equilibrium issues, disequilibrium/vestibulopathy. Single-sided vestibulopathy is vestibular system damage on one side of the head. It results in imbalance issues that an individual can recover from in a few days or a few months. Bilateral vestibulopathy is vestibular system damage to the nerve on both sides of the head. "The symptoms typically include imbalance and visual disturbance. The imbalance is worse in the dark or in situations where footing is uncertain while spinning vertigo is unusual. The visual symptoms referred to as "oscillopsia," only occur when the head is moving (J.C., 1952)." Bilateral vestibulopathy results in complete loss of the part of the body that distinguishes motion. With time, a section of the brain will help with adaption to motion, but vestibular rehabilitation therapy (VRT) is necessary. Without VRT it is easy to develop muscle weakness and over time potentially result in an inability to walk at all. Sometimes balance issue is indirectly from vestibulopathy, like medications that can increase disorientation, other brain tumors, or weak core muscle strength. Talk to your doctor. 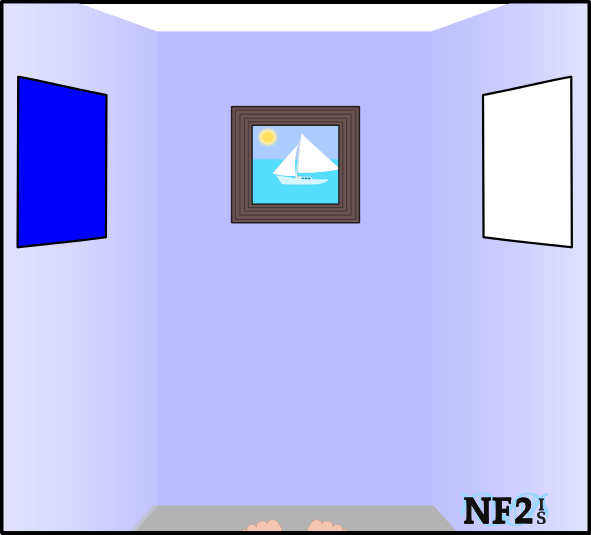 The most common location for tumors to grow for individuals with NF2 is in the brain along the Vestibular Nerves. The tumors are an overgrowth of a section or sections of the nerve, an overgrowth of the schwann cell. 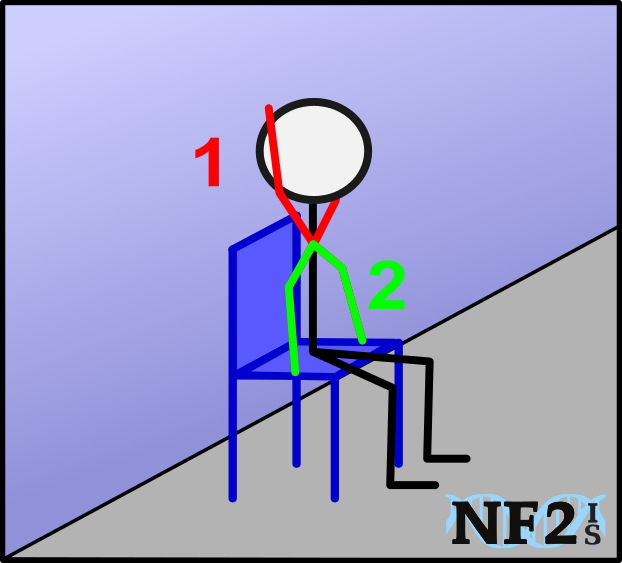 There are two vestibular nerves left and right, one on each side of the brain since there are two cranial nerves for each nerve type, one affecting the left and the other the right side of the body. The Vestibular Nerve is responsible for the function of the vestibular system which is responsible for balance. 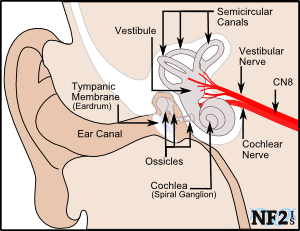 Vestibular Schwannoma (VS) that grow on a Vestibular Nerve will typically also damage the cochlear nerve as well. 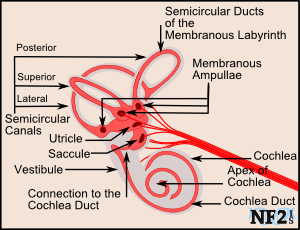 The cochlear nerve is responsible for the function of the cochlea and therefore hearing. Cranial Nerve 8 (CN VIII), the Vestibulocochlear Nerve starts at the brainstem and splits to become the vestibular nerve and the cochlear nerve. The three semicircular canals of the vestibular system can be best understood by understanding the workings of a gyroscope, used by ships and planes. 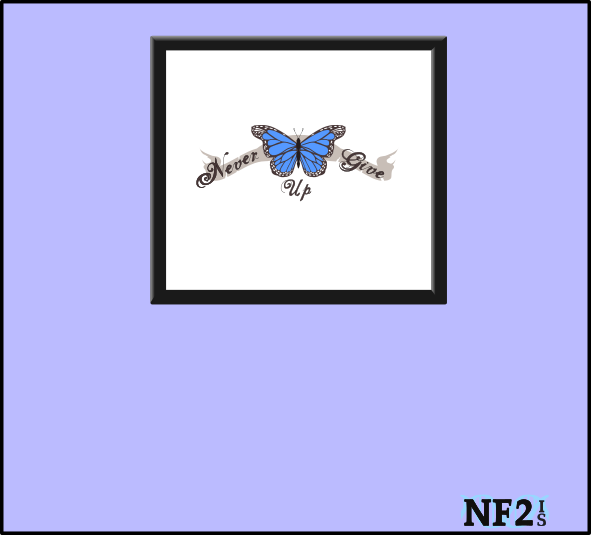 Since it can be a slow process from the point one nerve starts to become damaged to the point where both nerves are completely broken, individuals with NF2 tend to adjust better and faster than individuals whose nerves are damaged for other reasons. However; since vision is used to compensate for the loss of these nerves, in bad vision situations like night or if vision issues develop, balance issues will continue to be a problem. Vestibular rehabilitation therapy (VRT) is very important following vestibular nerve damage. The dizziness, vertigo, balance problems, and other symptoms can lead to unnatural standing and walking methods. This improper compensation can be even harder to correct, lead to worsening of symptoms and often causing headache, muscle tension, and fatigue. VRT is an exercise program used to treat people of many different ear conditions that result in damaged Vestibular Nerves. Because of the number of people with these issues, people trained to do VRT are not hard to find. 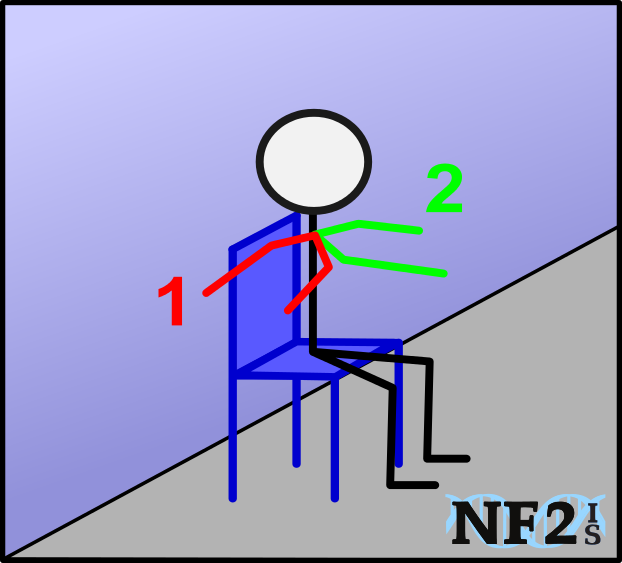 First attempts at the different movement from vestibular issues for recovery should be done with the presence of another individual. Since the progression of vestibular damage is different for everyone, it is important to get help from a physical therapist. Differences include duration from beginning to complete failure of vestibular system loss bilaterally. When attempting recovery of balance after vestibular system damage or failure, avoid painkillers in the opioid family. Codeine, Percocet, and Tylenol #3 include side effects of lightheaded and dizzy. 1) looking at a streetlight ahead of you, 2) look at a picture on a wall, 3) look ahead at the end of the aisle at the grocery store, or 4) look at the face of the person you are walking to meet. Since the use of vision for visual cues, is necessary for walking stability following Vestibular Nerve damage, it is common to have problems walking at night or in other low or no light situations. 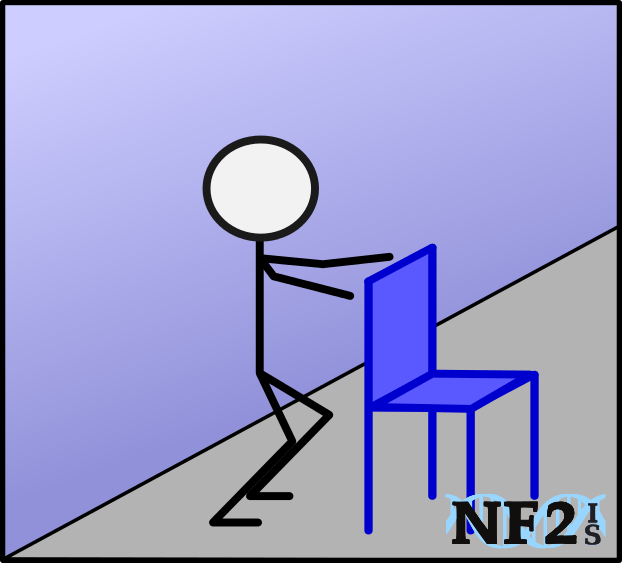 Exercises in the sitting position or standing position can be done to build leg muscles. The stronger they are, the better your balance will be. Medication, visual cues, and muscle strength will help in walking on flat, and even surfaces, but the practice of walking backward or on uneven terrain (like grass) can help with fall prevention. Remember to stand with back straight, chest out, head up looking forward as far as possible. Automatic response to vestibular system issues is slouched shoulders, hands ahead to grasp something; done long-term this results in upper spinal cord issues. Speak to either a physical therapist, about the best shoes to wear for better balance. Learn how to use a cane for stability , or consider a balance service dog. * Note: Some Pain Killers including; 1) Codeine, 2) Percocet, and 3) Tylenol #3, can cause Lightheadedness and Dizziness. Taking these things can make walking after Vestibular Nerve damage even more difficult. Bisht, Manisha, and S. S. Bist. "Ototoxicity: the hidden menace." Indian Journal of Otolaryngology and Head & Neck Surgery 63.3 (2011): 255-259. Emmanouil, Beatrice, et al. "First report of the efficacy of vestibular rehabilitation in improving function in patients with Neurofibromatosis type 2: an observational cohort study in a clinical setting." 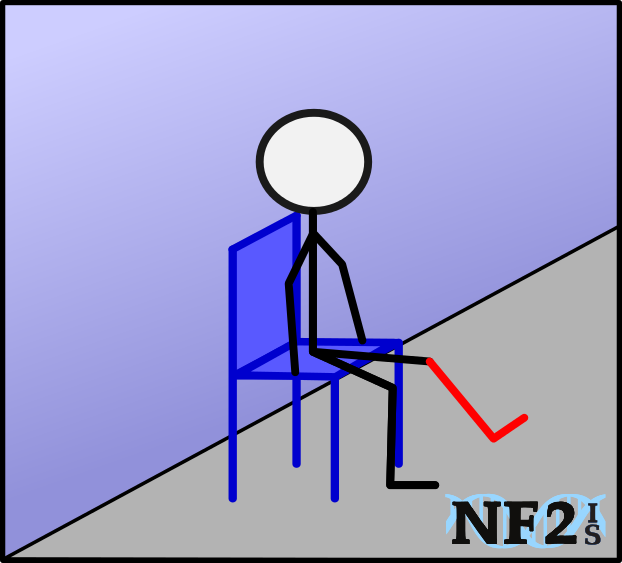 Disability and rehabilitation (2018): 1-7. Black, F. Owen. "Acquired bilateral peripheral vestibulopathy." Handbook of Clinical Neurophysiology 9 (2010): 333-352.